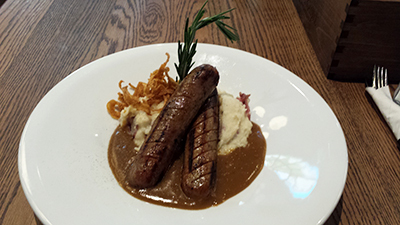 Bangers ‘n’ mash. Technically, sausages and potatoes. Meat and starch. Say it loud and say it proud. A pure British treat, and none better (hmmmm, maybe there is, readers?) than what the Brits in Toronto crew had at the Elephant & Castle pub on King Street West recently. First off the E&C on King has the lunch schedule down to a tee. In at 12 noon, ordered, eaten and paid for (with a nice tip because the service was great!) by 12:27 p.m. Not bad. The bangers? Sliced nicely for easy consumption, a good seasoning and generous sizes. The mash? Nice and creamy. No lumps, buttery and filling. The onion straws? A little greasy, but nice and crunchy. The gravy? We loved this part. Loads of it. Nice and thick. Not watery. Good to the last drop! The sprig of rosemary. Forget it. Waste of plate space. This entry was posted in Uncategorized and tagged bangers 'n' mash, brits in toronto, elephant & castle on October 23, 2014 by britsintoronto.